Eberhard Arnold chose to live out Jesus' teachings by embracing their self-sacrificing demands. In this collection of talks and essays, he calls the reader to live for the overturning of the prevailing order of injustice. In its place we must build a peaceable society motivated by love. 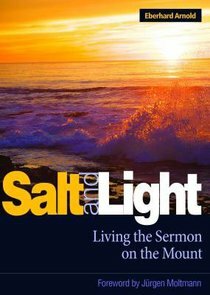 - Publisher Salt and Light puts hands and feet to the demands of the Sermon on the Mount from the viewpoint of a writer who believes they are not only viable, but inescapable - something for us to live out today. In the Sermon on the Mount, Jesus puts aside his usual parables and speaks plainly in language anyone can understand. Yet for centuries countless scholars have dissected and analyzed these important words - and dismissed their demanding precepts as unrealistic or symbolic. Like Francis of Assisi and others, Arnold chose to live Jesus' words. He found new life by embracing the self-sacrificing demands of the Sermon on the Mount. This collection of talks and essays vividly describes a healing, energizing power for those burdened by the concerns of daily life. Arnold calls us to live for the Sermon's ultimate goal* the overturning of the prevailing order of injustice and building in its place a just, peaceable society motivated by love. Salt and Light puts hands and feet to the demands of the Sermon on the Mount from the viewpoint of a writer who believes they are not only viable, but inescapable - something for us to live out today. In the Sermon on the Mount, Jesus puts aside his usual parables and speaks plainly in language anyone can understand. Yet for centuries countless scholars have dissected and analyzed these important words - and dismissed their demanding precepts as unrealistic or symbolic. Like Francis of Assisi and others, Arnold chose to live Jesus' words. He found new life by embracing the self-sacrificing demands of the Sermon on the Mount. This collection of talks and essays vividly describes a healing, energizing power for those burdened by the concerns of daily life. Arnold calls us to live for the Sermon's ultimate goal* the overturning of the prevailing order of injustice and building in its place a just, peaceable society motivated by love. Arnold, pastor and social revolutionary, organic farmer and maverick theologian, was widely sought as a public speaker in his native Germany before and after World War I, and influenced thousands during his lifetime.